Shuswap Falls RV Resort is located 22 kms east of Enderby, BC, Canada, on the banks of the Shuswap River and with a view of – you guessed it – Shuswap Falls. 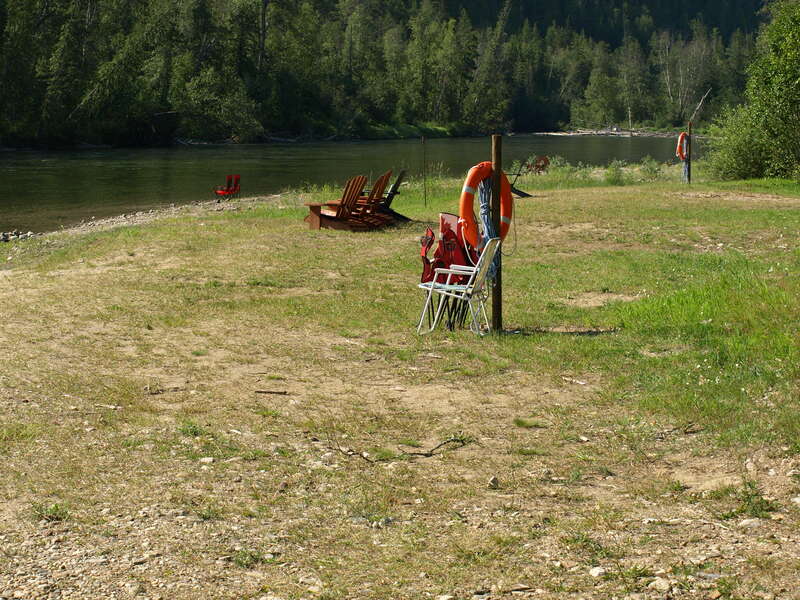 Many of the sites in the resort are owned by the members of the Shuswap Falls RV Resort Club but they do offer some rentals. Because of this, making a reservation is a good idea. The sites are spacious, and offer a variety of types of sites – sun, shade, partial shade, all with full hookups. Enderby is about 5.5 hours from Vancouver, BC. 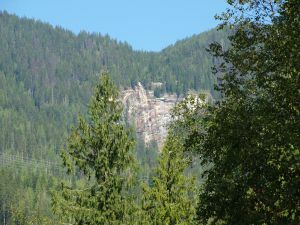 The resort itself is another 20 minutes or so from town, on the road to Mabel Lake, which is about half an hour from Enderby. 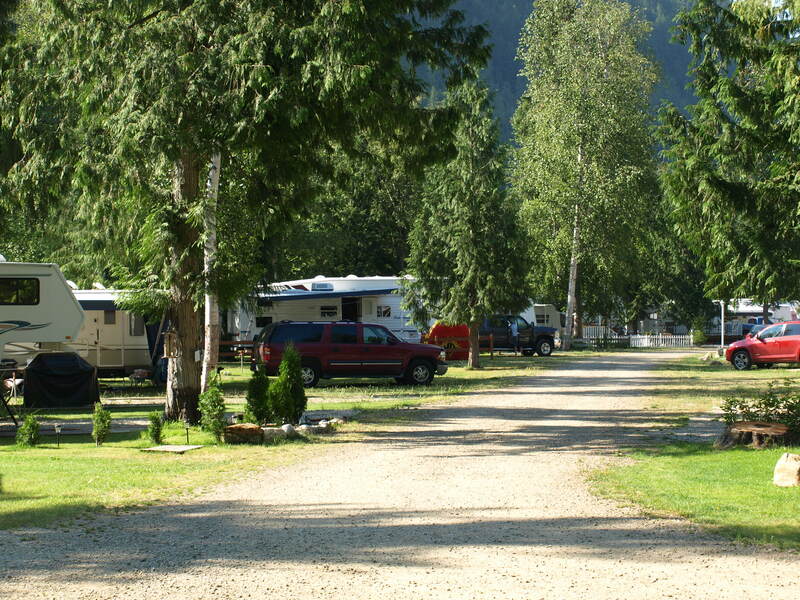 Mabel Lake is a busy resort area, and Shuswap Falls RV Resort offers a lovely quiet alternative to the busy-ness you’ll find there. Since a number of the sites (along the rows closest to the river and along the creek and a number of others) are for members, it seemed to be mainly the middle sites that are available for rentals. I wouldn’t let that put you off though – I remember almost all the sites being quite lovely, and nothing in the resort is far away. Relax on the shore of the river and read a book or watch the tubers floating past (it is a non-stop source of entertainment)! We stayed at the resort the last week of July 2010 with our two boys who were in their early to mid teens. We were given Site 73, and the wonderful couple that ran the resort took us right to our site and helped us get set up. 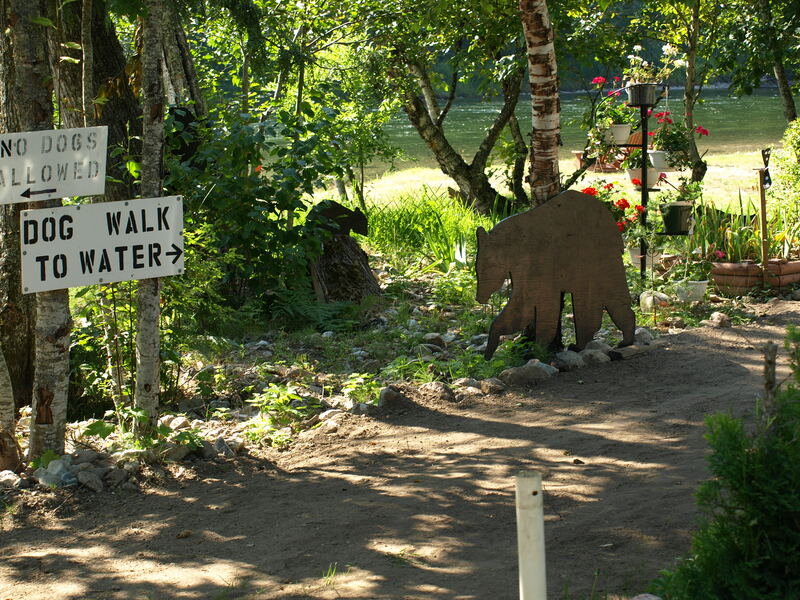 Our site, like all sites in the resort, was a short walk to the water or to any of the other activities. The sites are level gravel but in between grassed with lovely shade trees. All the rent-able sites seemed to be quite large, and I can’t comment on any that I recall as being particularly better or worse than others. The one thing that still stands out to me about this resort was the friendliness of the people there. Right from being greeted on arrival to every time you walk around the resort, people love to wave and say hi and have a chat. We got invited over to some of the other sites for drinks a couple of times, and these same people took us along with our inflatables up the river so we could float back down to the campsite. That was a huge highlight and I would recommend it for any family if your children are old enough, but please wear lifejackets. The water can be quite cool even in summer and there is a strong current, which means you’re moving quickly and not always in the direction you want to go in. 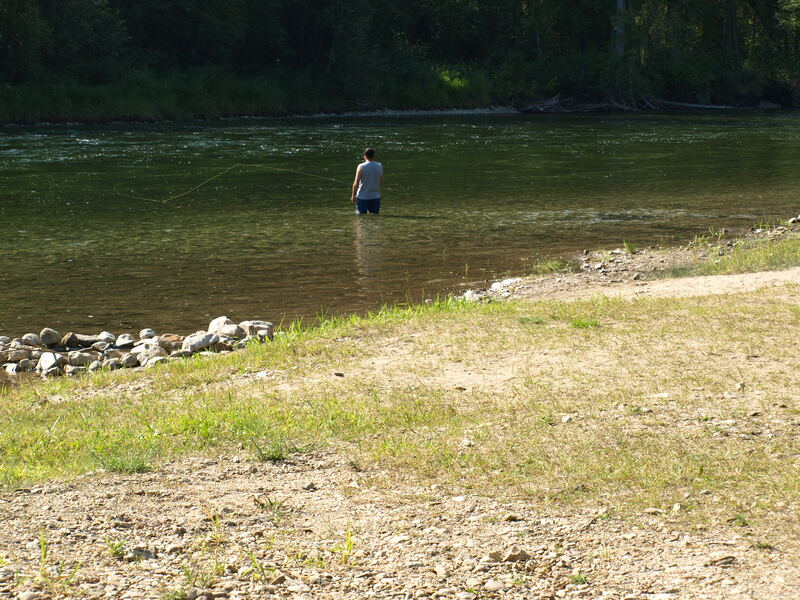 Other days we would just walk down to the river and sit on the (rocky) shore, jumping up to go in for some swimming exercise in the river every now and then. As you get away from the shore, the current is stronger, and it was fun to watch the brave swimmers get out there and swim strongly against the current, only to hold their place in the water – what a good workout! There is an almost-constant stream of floaters coming down the river in front of the resort in any kind of floatation device you can imagine. Hours of entertainment to see them try and stay afloat and on course. We drove to Mabel Lake one day as well (not Mabel Lake Provincial Park which is a different area of the lake that is accessed by a different road). 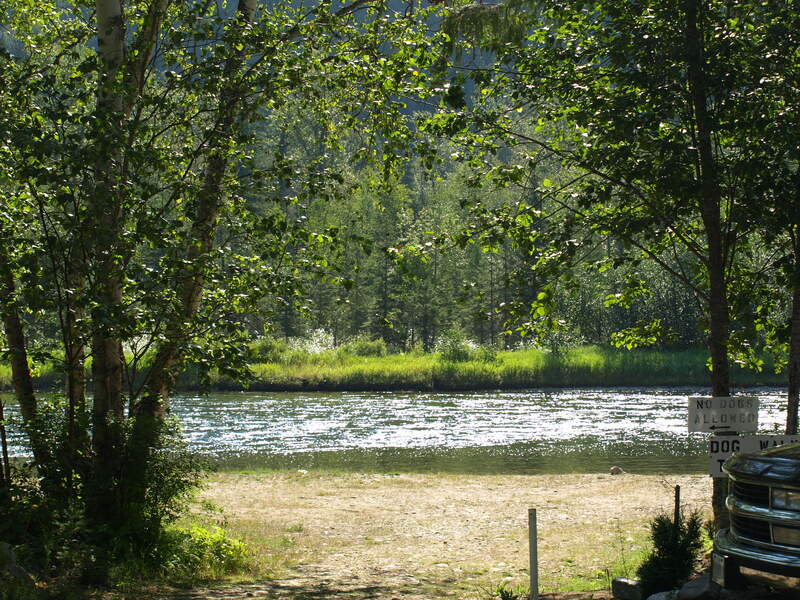 The road from Shuswap Lake RV Resort to Mabel Lake runs along the river and there are lots of little spots along the riverbank to stop and enjoy the water or the view. Mabel Lake itself was extremely busy and although we had planned on enjoying the beach there, we found it too crowded with no available parking, so that plan was cancelled. We did go for dinner at the Mabel Lake golf course, where my husband also played a round there the following day. It is a beautiful course and setting, and he would highly recommend it. We went into Enderby, where we visited some friends, wandered around the downtown area with its many eclectic shops and cafes, and enjoyed lunch there. We also managed a trip to the drive-in, which is a fun family thing to do, especially with younger children. 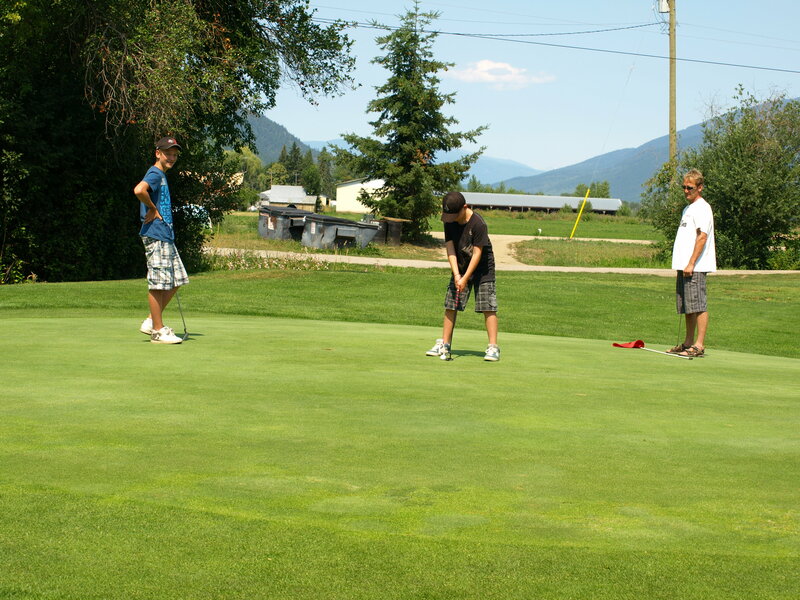 Also took the boys to Birchdale golf course (9 hole golf course in Grindrod, more suitable for families than the Mabel Lake golf course), less than 10 kilometres from Enderby. Overall I would say this is a great resort – just beware you will have to drive to everything but you will enjoy the friendly peaceful atmosphere. ← Novelty Lights For Your Awning.